The MGB has some features similar to a sleeve gastrectomy but one anastomosis mimicking certain aspects of the traditional bypass. The origins of this procedure known as Mason’s procedure was coined in 1967. This was not popular and subsequently abandoned as it caused bile reflux (not acid reflux) in patients. There were also some concerns of long term risk. With some evolutionary differences to its configuration in 1997, the procedure is becoming more popular. 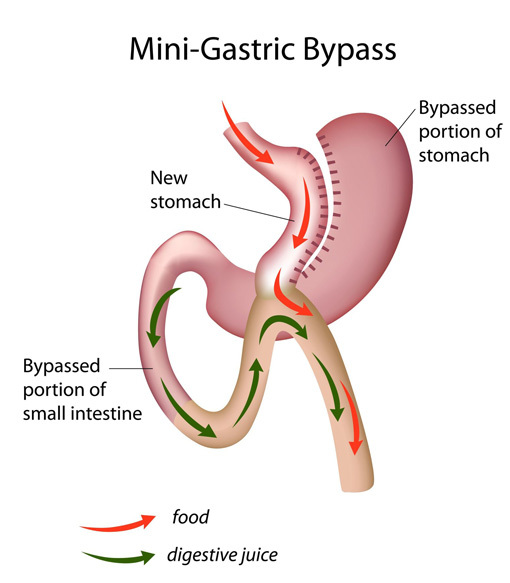 The stomach is fashioned like a “sleeve gastrectomy (ie long and thin)”, then approximately 200cm of small bowel is “bypassed” similar to certain aspects of a Roux-n-Y Gastric Bypass. However, as MGB is NOT a “Roux-n-Y” configuration, the MGB carries “bile/ digestive juices” from the liver and pancreas into the “sleeved portion” of the stomach. Hence bile reflux is expected to still occur. Complication rate comparable to the other procedures. Risk of “bile reflux” in the intermediate and long term; and consequences in the younger age group. There is similar risk of developing nutritional deficiencies due to a reduced intake of volume of food. Additionally there is also malabsorption that is surgically created. Similarly deficiencies in B12, Vitamin D, iron, folate, calcium and zinc do occur. Hence these nutrients need to be supplemented and closely monitored with regular blood test. “Dumping Syndrome” can result due to changes in anatomy and the gut flora. Dietary modifications with limitations to high sugar food and alcohol needs to be adhered to. At least a 6 – 12 monthly review of nutritional adequacy (including annual blood test). Mandatory requirement for multi-vitamin supplementation according to blood test results. IFSO (International Federation for the Surgery of Obesity and Metabolic Disorders) prefers the terminology of OAGB as the word “mini” may be misconstrued by the public as a “lesser operation”. However it carries similar risk of a Roux-n-Y Gastric Bypass in many ways.